Slavery and the sexual availability of slaves in the Roman Empire helped form Christian sexual ethics. Jesus of Nazareth enjoined his followers to act as slaves, not to liberate their slaves. Early Christian theologians were indifferent to the moral dilemmas of slaves who were not in a position to say "no". This early Christian complicity in the sexual exploitation of slaves disturbs me. Even more disturbing is the realization of the many ways that American culture today prejudges the morality of human bodies based on their gender and social status: rich, poor, Black, White, Native American, Latino/a, male, female. For example, rapists of Black women receive fewer convictions and lighter prison sentences than rapists of White women. This insult is consistent with an ancient tradition that treats low-status women as lacking the right to protect the privacy and integrity of their own bodies. Indifference to the moral harm of sexual coercion-an indifference that characterized early Christian sexual ethics-persists today in Christian discourse. Christians today who are horrified to learn of the sexual exploitation of slavery are too often silent about the exploitation of other persons who are not in a position to say "no" to sexual advances-prisoners, for example, and children in homes, churches, and other settings. The Church requires healing. Our Scriptures and rituals offer resources for creative reform of our traditions, and, ultimately, for healing. 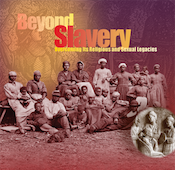 This video was recorded on October 15-16, 2006 as part of the conference, "Beyond Slavery: Overcoming Its Religious and Sexual Legacy." It was sponsored by the Feminist Sexual Ethics Project in the Near Eastern and Judaic Studies Department at Brandeis University.